June is finally here, and that means it’s National Adopt a Shelter Cat month! Cats are a great addition to your home, and if you’ve thought about getting a cat in the past, then now is the perfect time. Check out your local shelter to find your new favorite feline, and if you’re not yet convinced, keep reading below where we give you a few reasons why you should adopt a shelter cat right away! When you decide to adopt a shelter cat, one of the first things you will want to do is schedule a checkup with a vet. Luckily, if you’re in the Los Angeles area, 911 Vets can help! We are a mobile vet clinic that offers not only emergency services, but we will also come to your home to provide you with routines checkups and preventative care. Whether you need a feline leukemia vaccine, spay and neuter services, or otherwise, our mobile vet will bring the clinic to you. Contact us today to schedule an appointment for your new cat today! One of the best things about adopting from a shelter is that you can choose from a wide variety of furry felines. You can find old cats looking to spend the rest of their years in a loving home, or young cats looking for someone to entertain them with fun toys. Looking for a long-haired cat that you can spend hours grooming, or do you want a low-maintenance short-haired cat? No matter what type of cat may be on your radar, there’s a good chance you will be able to find your new favorite kitty at a shelter. Cats have very distinct personalities. Some cats are very independent, while others love to snuggle and follow you around wherever you may go. Many shelters have programs set up that will help to match you with a specific cat that will match what you’re looking for in your new feline friend. In some cases, you may be required to fill out a survey that will tell you which cat personality will fit what you’re looking for. In other cases, a shelter worker may ask you what you want in a cat and they will be able to point you in the direction of several kitties that will fit the bill. More often than not, if you decide to adopt from a breeder or even a pet store, you will have to pay a large adoption fee. On the other hand, when you adopt a kitty from a shelter, you will still have to pay an adoption fee, but it is often lower in cost and includes a microchip, spaying/neutering of your new cat, and any necessary vaccinations or medical care before the adoption. All of the included procedures make the adoption fee worth the price, and you’re still saving money! That being said, if you choose to spoil your new furball, you may still end up spending a lot of money. Shelter Cats are Ready to Go! As we mentioned above, when you adopt a shelter cat, the fee you pay usually covers any necessary medical procedures, vaccinations, and care for your kitty prior to the adoption. Because the shelter already took care of your cat’s medical care, it means that once you adopt your new feline, he or she is usually ready to go! Typically you will have to schedule a post-adoption veterinary visit, but many shelters offer either a discount or a free visit. Not to mention, if your new pet is already up-to-date on his or her shots, there’s a good chance you won’t need to pay any medical bills right away. In addition to taking care of medical necessities, the majority of shelter cats are already litter box trained when you take them home. It’s a win-win situation! 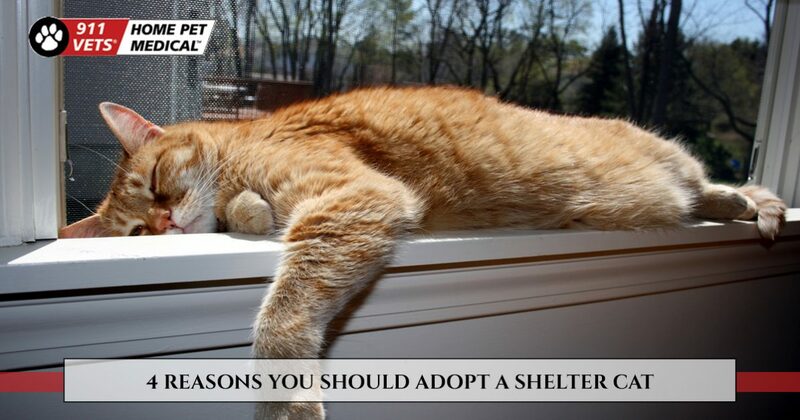 These are just a few reasons that you should adopt a shelter cat. If you’ve already adopted a furry feline, then you may be in search of a new vet. Luckily, 911 Vets proudly provides the residents of Los Angeles with professional veterinary services right in your home! Our mobile vet clinic offers everything from emergency services to routine checkups. When it comes time to schedule an appointment for your new cat, look no further than 911 Vets. Contact us at 310-341-0216 today!